This is a funny one. This is a picture looking straight down into the water below a small bridge. 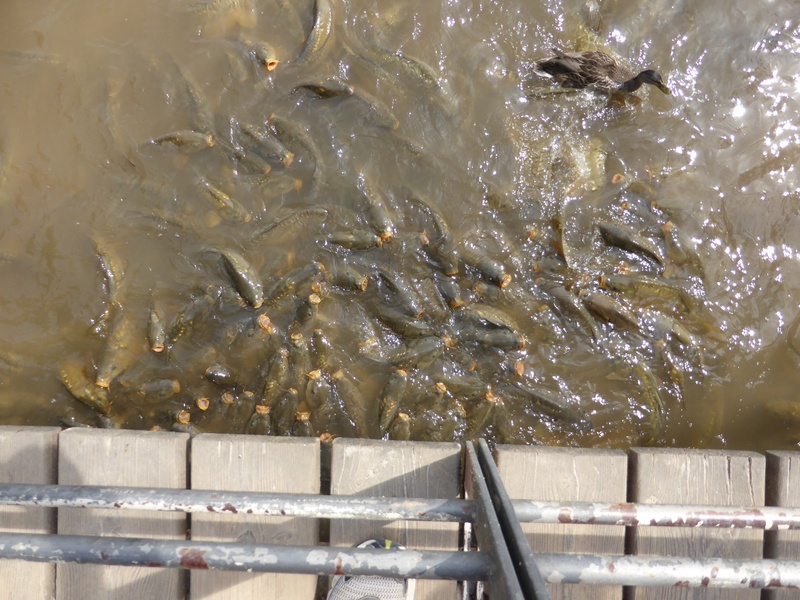 Pictured are many carp, and a single duck, all fighting for the cookie crumbs that Rod dropped into the water. 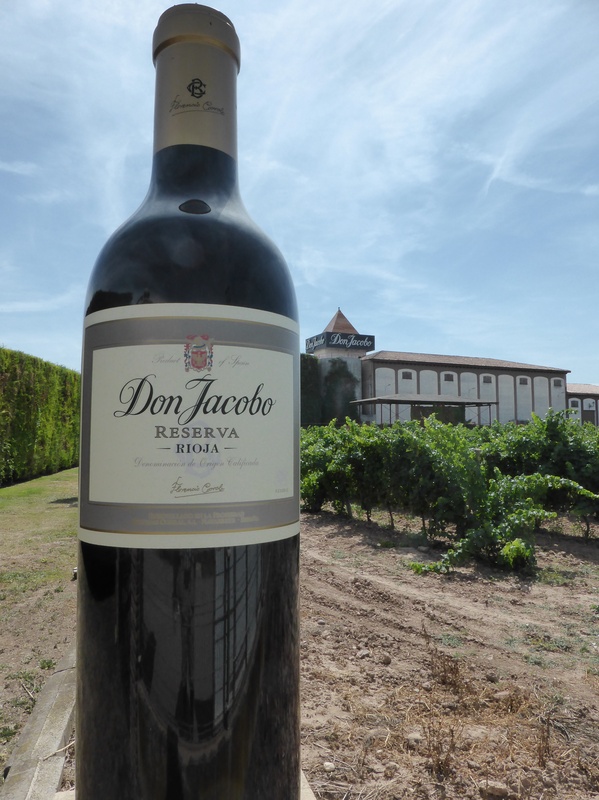 A giant stylized bottle of wine from the winery just outside the town we are in – Navarrete. A bottle of some of the local wines sells for as little as $3 – it is considered food and therefore not taxed! 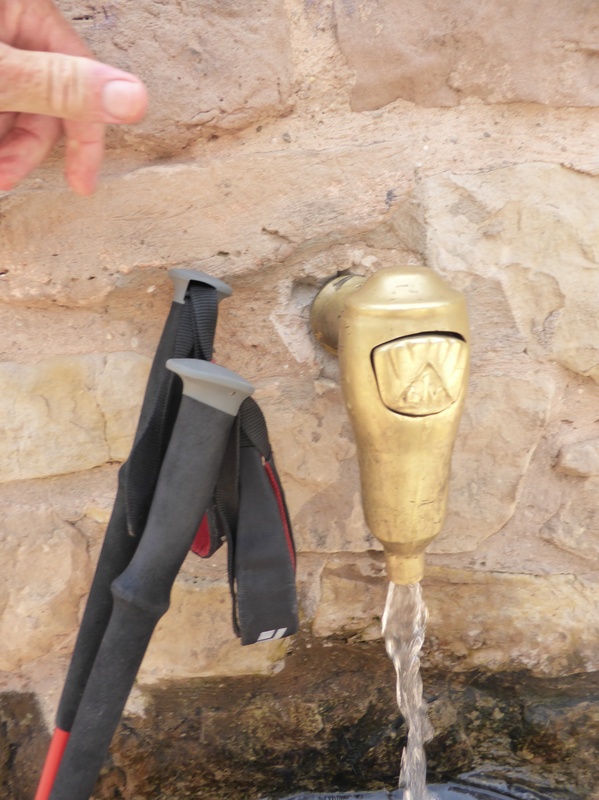 a Camino water tap… Rods poles beside. The poles are an absolute must. Makes for much easier climbing and safer descents. Thank you Heather! 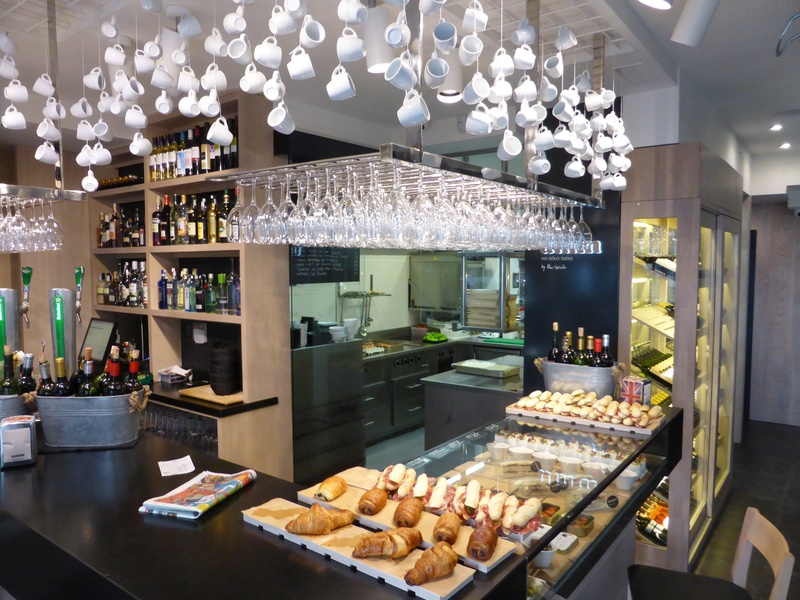 An upscale pintxos bar…(we know it as tapas- a diagonal slice of French bread with all sorts of different meats, cheeses, veggies, fish, you name it. Three is a meal. As we were looking to a relatively short walk today, we had a relaxing breakfast and departure. We enjoyed Logrono very much. It has balanced the past and the future well. Particularly impressive are the many green spaces and parks everywhere. When you live in a land of hot sun it seems you value the shade of trees. When we are walking we feel the difference immediately once we are shaded. After walking to the outskirts we found ourselves on an easy walk through parkland. We stopped at a recreational area, Grajera Park built around the reservoir which marked the half way point for today. 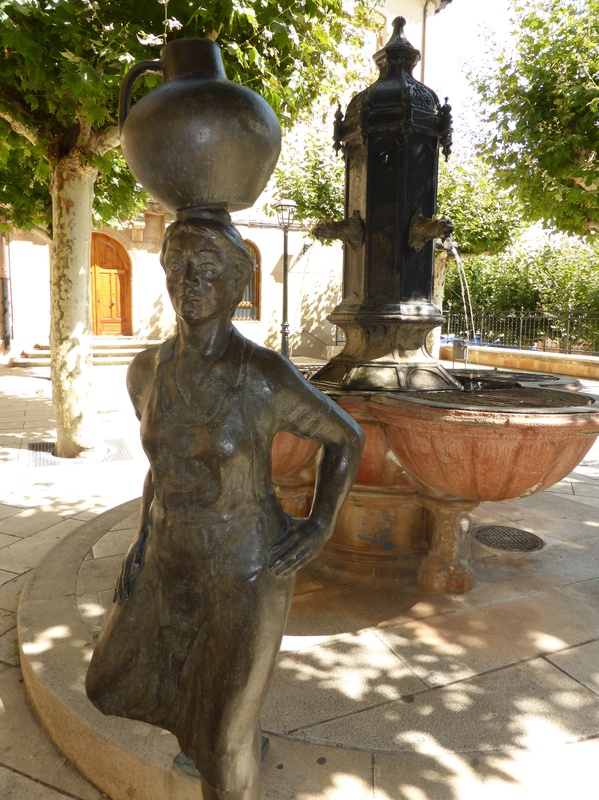 Our destination, the village of Navarrete is like all our destinations —on top of a hill:-) It is not a difficult climb and since most of our walk has been through parkland and vineyards we feel lucky! The vines are heavy laden with the most beautiful grapes. They are soon ready for picking. At a town we will visit in two days, pickers from North Africa are being hired right now. It is interesting to note that almost all the Camino after the Pyrenees is through orchards and vineyards which are very accessible from our path. There are no signs prohibiting picking the fruit and yet no one does. This respect is encouraging to see. Navarrete is a small but beautiful village. It is a centre for wine making with several large vineyards nearby. The parish church, Iglesia Parroquial de la Asuncion de Marie, is famous (or infamous) for having the most bling-bling altars on the whole Camino. They are something to behold. Our personal comfort is the simplicity of our home church in Ladysmith. Navarrete also is noted for pottery but we could not find any shops. Perhaps it is sold somewhere else…The thunderstorms did not come today. We would not mind a little cooling rain.